A buddy of mine recently sent me an email regarding coming back from nasty crash that he had recently. He was having some issues getting confidence back and getting back up to speed on the bike. The text below is an edited version of my response. I’d say probably 20% of my biz is from people that have a “crash hangover.” In other words, they had a big crash and are having a tough time getting their head back in the game. Their confidence is rattled and all they can seem to focus on when they get on the bike is what could go wrong…again! Coming back from a big crash isn’t easy. Like most things difficult, curing that crash hangover takes some time and effort. Yet, it seems that everybody feels that they should to just be able to snap their fingers and make it go away. Unfortunately, it doesn’t work that way. But I do have some good news: there is a cure! First, let’s take into consideration, that the “crash hangover” is there for a reason. Your primal-emotional brain is telling you, Hey, last time we did this bike-thing we got WORKED! So maybe we shouldn’t be doing this. That’s just common sense and good ol’ self preservation at work. But, your smart human-brain knows that you still want to ride bikes and that you definitely can still do it at a high level. So you ague with yourself.. but, that primal brain is gonna win. And, it’s real tough to just over-ride that fear. So, you have to re-boot the system. 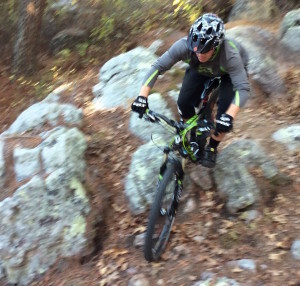 First thing you have to do is just get some seat time, back on the bike… But do this on trails that offer you absolutely no challenge or threat, what-so-ever… Put in a few rides on trails that are easy and boring. If there is anything that freaks you out — even a little — get off and walk. What you’ll be doing is convincing yourself that you’re not going to die every time you throw a leg over the bike (Post-crash, you”re your primal brain isn’t so sure of this). Even though you know this to be true, you gotta feel it a few times to authentically trust it. Also — more logic — is that you know that you still can ride at the level you were at, previously. That’s a fact. Can’t argue with the facts… And, riding — even with the occasional gnarly crash — is way better for you than not riding. Again, facts… so get out there and do it… Take it easy for a bit, and it’ll come back. 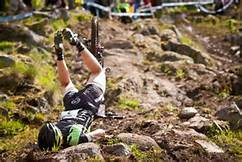 I think the worst part of this is that sometimes — if you ride hard and push it — you’re just going to crash hard. No way around this. But again, the benefits of going out on the bike and getting’ after it far outweigh not riding for fear of getting hurt. Finally, we don’t multi-task. “Multi-task” may be the catch phrase of the day/year/millenium, but our conscious brains actually are unable to focus on more than one thing at a time (unconscious is different). The last one also goes for times when you’re doing something supper hairy and right on the edge of your skill level. It takes full commitment in these situations and fully focused on the solution is the only way to have full commitment. But, don’t worry so much about the last one yet. Right now, just get out and get that seat time in on the easy stuff. Get a few of those under your belt. Work your way up with baby steps to tougher trails. When you do start pushing a bit, practice focusing on the solutions; give your mind something useful to do and it won’t wander to the fear. I guarantee if you take the time to do this stuff, you’ll get back to where you were, but again, it will take a little time. Thanks for the advice. I. Just had a big crash where I separated my shoulder and dislocated my finger as well as all the abrasions to my head and face. It’s a real confidence killer to wreck yourself like that. I am going to use an exercise bike while my shoulder gets better mostly to stay in shape but I can tell you there is already some apprehension about getting on my “real bike”. I am going to take it slow to start. Thanks again for your article.